Leonard’s Mills is on the run! Did your Dad work in the woods? Grandfather? 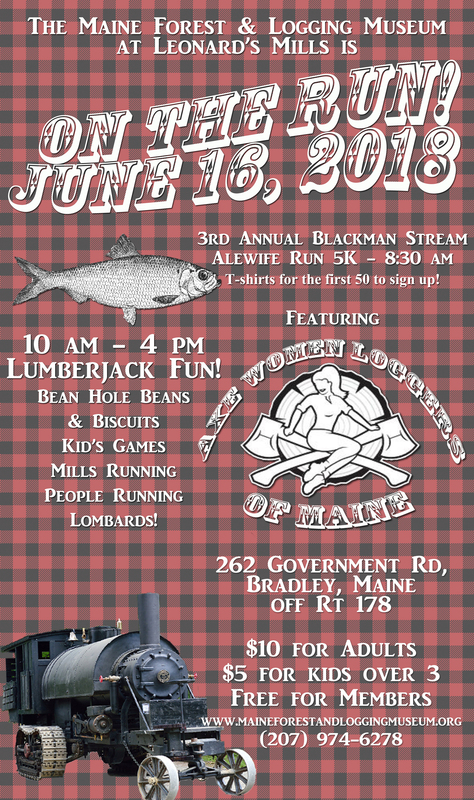 Bring them out to the Maine Forest and Logging Museum Father’s Day weekend, Saturday, June 16th, to reminisce, see some axes swinging and have some bean hole beans! “On the Run” has lots of moving parts for the day. The day starts at 8:30 with the 3rd Annual Blackman Stream Alewife Cross Country Run. Head into the Penobscot Experimental Forest as fast as you can! Pre-register on our website or sign up the morning of the race. Free shirts for the first 50 registered. The rest of the event gets in full swing at 10:00. The Axe Women Loggers of Maine will show their stuff–just how fast can they swing an axe? The all female timber sports athletes are world champion choppers, sawyers and axe throwers. They will be demonstrating throughout the day. It takes about 4 hours to get up steam in the original version of Lombard’s loghauler, but the gas-powered one just has a key to turn. A great opportunity to see two of the machines that revolutionized logging in the Maine woods restored to working order and being driven once again. Sawmills and more..lots to see in operation and a great place to have a dish of bean hole beans with a biscuit. Head out to the Maine Forest and Logging Museum, aka Leonard’s Mills, 1 ¼ miles down the Government Rd. off Rte. 178 in Bradley. Saturday, June 16th, Race 8:30, event 10-4:00. Call Sherry Davis 974-6278 or email [email protected]. Race forms are on the website www.maineforestandloggingmuseum.org .